The Dalmatian (Croatian: Dalmatinac or Dalmatiner) is a breed of dog widely associated with Dalmatia, a region of Croatia, although the exact origin remains unknown. It is noted for its white coat with either black or liver spots. 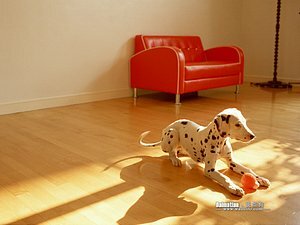 Dalmatian puppies are born white, and their spots come in gradually over the period of a couple of weeks. The most common colors for Dalmatians are black or liver spotted on a white background. Other spotting colors, though not permitted for showing, and rare, are blue (a blue-grayish color), orange or lemon (dark to pale yellow), brindle, mosaic, and tri-colored (with tan spotting on the eyebrows, cheeks, legs, and chest).